Ribbon capacity up to 984"
TTP-247, Desktop Thermal transfer Printer, 203 dpi, Interface Options: USB, Serial, Ethernet, Parallel, Maximum Print width 4.25", External 8" outer diameter media unwinder with 3" core holder. USB cable included. 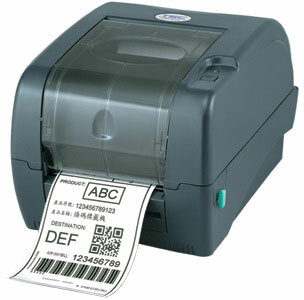 TTP-247, Thermal transfer label printer, 5 ips, 203 dpi, HC application. TTP-247, Desktop printer with cutter, Thermal transfer, 300 meter ribbon, 203 dpi, 7 ips, USB cable included. TTP-247, Performance Kit, Thermal transfer, 5 ips, 203 dpi, Health care Application, Internal Ethernet, External Label Unwinder. 2000 Standard Wax, 4.33" x 984' Black Wax Ribbon. Compatible with Industrial Printers. Single ribbon. Used with paper labels. Also available as a case (Part# 02000BK11030).